All three variations of this item are above the ground systems made of corrugated plate enhanced oil water separators. They are designed to remove free and dispersed non-emulsified oil and settable solids in accordance with API 421 standards (refers to the American Petroleum Institute standard of design and operation of Oil Separators). API 421 calls for a coalescing media of parallel plates inclined 45 to 60 degrees and spaced 0.75 to 1.5 inches apart to separate oil droplets of assumed 60-micron size. Equipment rental yards, automotive recyclers, military fleet operations, fork lift dealerships, trucking, marinas, food processing plants, groundwater treatment, aircraft maintenance operations, and oil field services. Inlet Compartment: Equipped with a non-clogging diffuser to ensure untreated water is distributed evenly to the separation chamber. 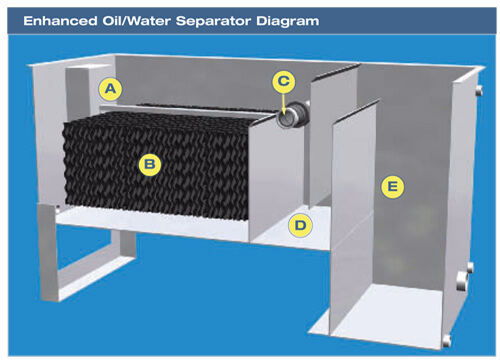 Separation Chamber: Has inclined parallel plate media for enhanced oil/ water separation. The flow through media is in across-flow configuration. This allows for the oil to rise without interfering with falling solids. Plates are installed to allow for easy dismantling, cleaning, and re-installation. Oil Collection: Separated oil is collected at the end of the separation chamber via a rotary skimmer that is easily adjusted for optimum oil collection efficiency. Clarifier: Located after the separation chamber and prior to the clean water chamber, the clarifier is equipped with a manual drain to facilitate the removal of the collected solids. Clean Water Chamber: Water will pass through the clarifier and into the clean water chamber, allowing for either gravity or pump discharge. 63" x 20" x 37"
59" x 36" x 84"
The separation chamber is equipped with inclined parallel plate media for enhanced oil/water separation. The flow through the media is in a cross-flow configuration. This allows for the oil to rise without interfering with falling solids. The plates are installed to allow for easy dismantling, cleaning and re-installation. The separated oil is collected at the end of the separation chamber via a rotary skimmer. The rotary skimmer is easily adjusted for optimum oil collection. The clarifier is located after the separation chamber prior to the clean water chamber. 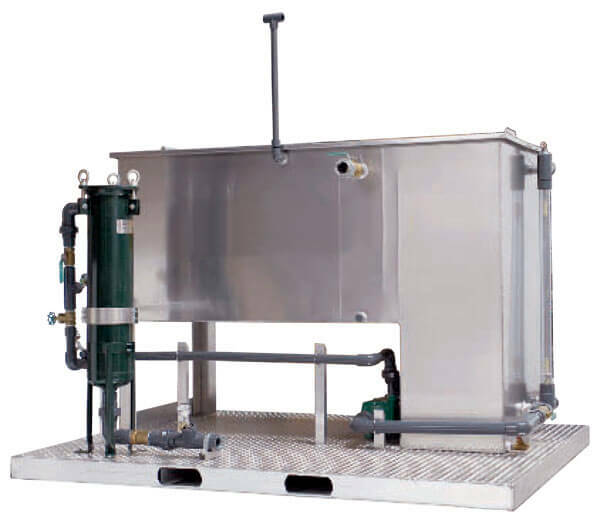 The clarifier is equipped with a manual drain to facilitate the removal of collected solids. The water will pass through the clarifier and into the clean water chamber. The clean water chamber allows for either gravity or pump discharge.